Leading a big organization is no easy job, but doing it in a different culture and business context is a whole different ball game. 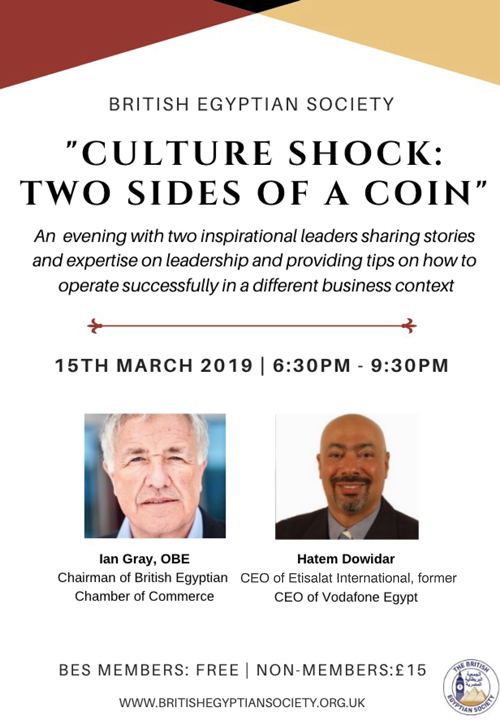 Join us on 15th March for an insightful evening with two inspirational leaders; Ian Gray, OBE, Chairman of British Egyptian Chamber of Commerce and former CEO of Vodafone Egypt and Hatem Dowidar, CEO of Etisalat International also former CEO of Vodafone Egypt. They will share their stories and insight on leadership at home and abroad and provide tips and recommendations on how to operate successfully in a different business context. There will be plenty of opportunity to ask questions and network afterwards. NOT TO BE MISSED! !